Krabi is a wonderland. Over the years it has grown in popularity, attracting visitors due to its unspoilt natural landscape that has the advantage of beautiful attractions both on land and offshore. Tours around the area generally take in some of the truly beautiful islands and usually feature a combination of destinations. 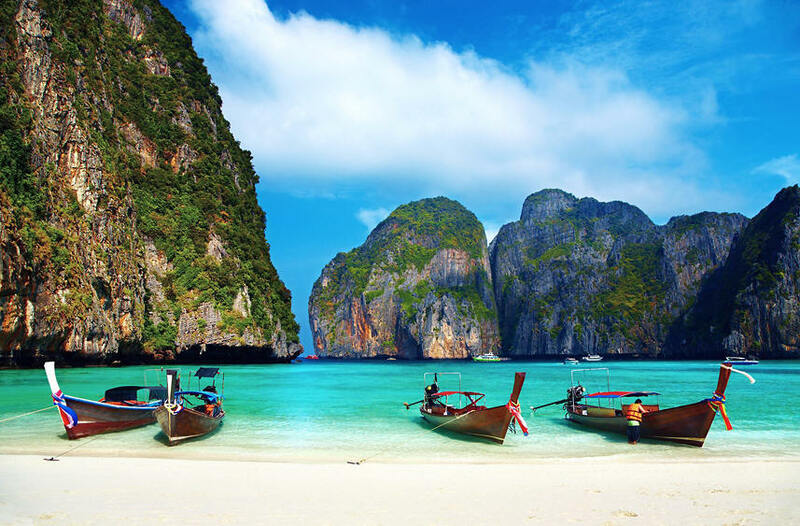 Experience the beautiful Phi Phi Island earlier without the crowds. 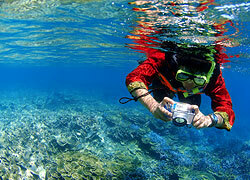 Snorkel, swim and sunbathe at the beautiful landmarks such as Maya Bay, Pileh Lagoon and Koh See. Enjoy a delicious buffet lunch at a hotel restaurant on Phi Phi Don Island. Set out across the Andaman Sea for a day-long tour of Krabi’s ‘4 Islands,’ and watch the tide uncover the slender spits that join the jungle isles. Explore the sinuous coastline by speedboat or traditional longtail, and leave the day’s first footprints on fine, powdery beaches. Snorkel in a sheltered lagoon, linger in the swaying shade of coconut palms, and enjoy a picnic lunch on a pristine beach. Stroll between Tup Islets and Chicken Island, then cast off again toward fantastical rock formations that soar above the tropical sea. Travel by speedboat to the Koh Hong Archipelago, a small chain of four islands in a National Marine Park set against Phang Nga Bay. 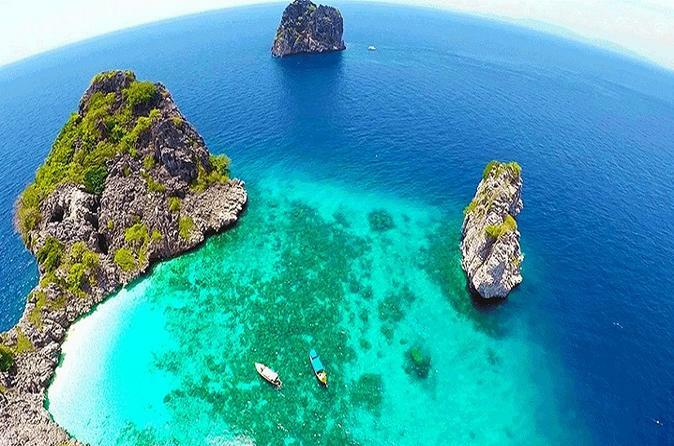 Visit the sheltered cove of Koh Lading, snorkel around the limestone karst called Koh Daen, see the impressive sandbanks of Koh Pakbia and explore the main island of Koh Hong. If you select the kayaking option, paddle into its hidden lagoon. Enjoy island hopping to the 7 paradise islands surrounding Ao Nang. Relax on unspoiled beaches, swim and snorkel in crystal clear waters and explore the amazing coral reefs and marine life of the Andaman Sea in Krabi. View of beautiful white sand beaches, crystal-clear water that you can enjoy seeing the fishes swimming around with the naked eyes and a fantastic underwater world. 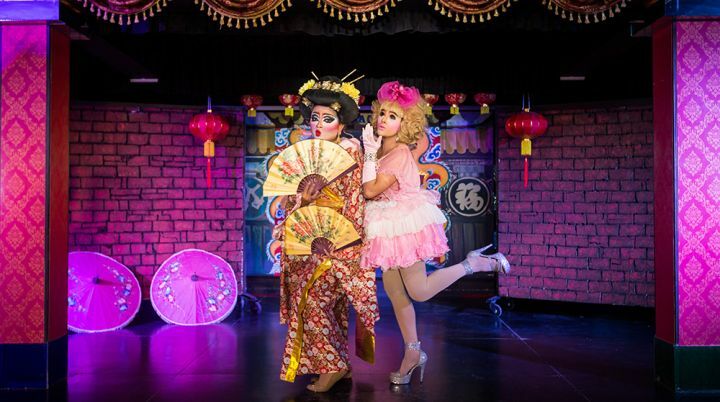 Cabaret show in krabi ,thailand is well known for its Lady Boy show This bar is located along Ao Nang and certainly very entertaining to watch.The lady boy did great lip syncing, wore beautiful costumes and were very professional. Only one along Ao nang, that has such a great and entertaining cabaret show with lady boy A must to see if you drop by Ao nang. 1. Our trip are not recommended for pregnant woman. Explore Phang Nga Bay on a full-day speedboat tour from Krabi. 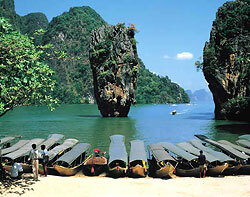 Visit the beach on James Bond Island (Khao Phing Kan), then zip over to Lot Noi Cave at Thalu Island. Have the option to upgrade for a kayak tour of the sea caves before taking a lunch break at a Muslim fishing village on Panyee Island., then return to Krabi after a day in paradise. We would like to introduce you to see all the highlight pictures in this program and read all itinerary detail and submit the booking for more value holiday in Krabi. 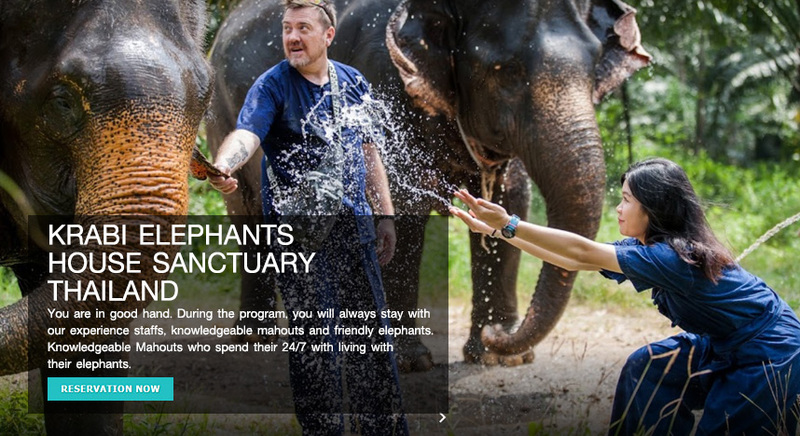 Price: Private Tour: Adult 2,500THB. Child 1,800 THB. 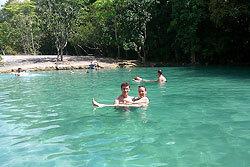 Visit Emerald Pool, swimming and relaxing in the nature bath. Crystal Lake. The water from somewhere come to the lake. It makes very clear crystal water nature Pool amid the forest. Visit Hot Spring Waterfall, enjoy and relax in the hot water. so good for your health, if you dare enough to take a bath. Explore the jungle landscape of Khao Nor Chu Chi National Park on a full-day adventure tour from Krabi that combines wild nature with local culture. 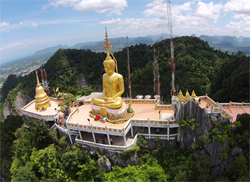 Soak in thermal springs surrounded by thick rainforest, visit a rubber plantation, then climb the 1,272 steps to Tiger Cave Temple, or Wat Tham Suea, a temple complex that sprawls through a maze of caves. 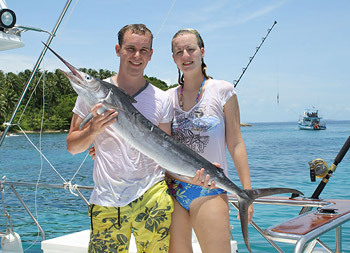 This 7-hour tour includes round-trip transport from Krabi beach hotels and a box lunch. Our professional guides will take you down the beautiful Tonpariwat wildlife sanctuary river & you can enjoy breathtaking views, but be warned, be prepared to get very wet! 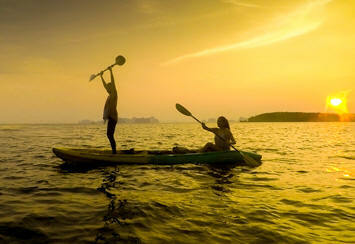 Choose your action-packed outdoor adventure on a guided day trip to Phang Nga province from Krabi. 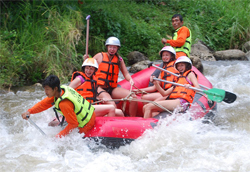 Go white-water rafting down 3 miles (5 km) of the Songprak River, which boasts Class II to IV rapids. Those with prior rafting experience can extend their trip to 5 miles (9 km). 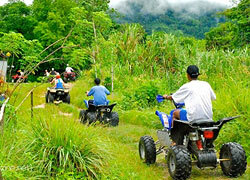 Add on optional ATV (quad bike) to make your day of adrenaline thrills complete. 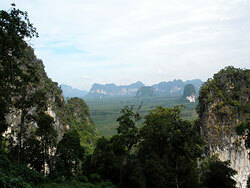 The day tour is perfect for an insight into the Khao Sok to get, and this without having to wander. 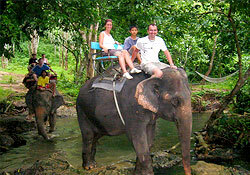 Join us in the Khao Sok National Park for elephant rides and explore the Sok River by canoe. 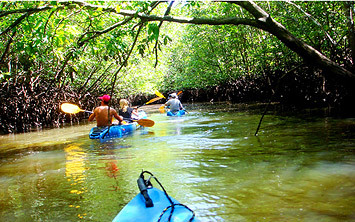 The stunning jungle scenery is an experience you will never forget! Get the perfect introduction to Krabi’s limestone on a half-day rock climbing tour at Railay Beach. Learn belay techniques and basic safety from an expert guide, then use a secure top rope to practice your skills on cliffs above Railay and Phra Nang. Work with a small group to scale routes that range from beginner to intermediate, and challenge yourself to take on some of the world’s most scenic rock. 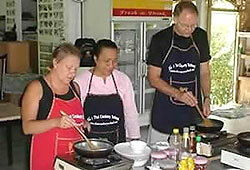 Learn how to cook Thai dishes during a 3- to 5-hour cooking class in Krabi. In a traditional home-style setting, you'll receive hands-on instruction, plus learn about Thai spices and how to use them in some of the country's most popular dishes. Hotel pickup and drop-off included. Select your preferred menu and time of day when booking. The joy of landing a huge catch, what is commonly called ‘a big one’ is immense and the joy of taking a photo snap with the big one in your hands is even greater. 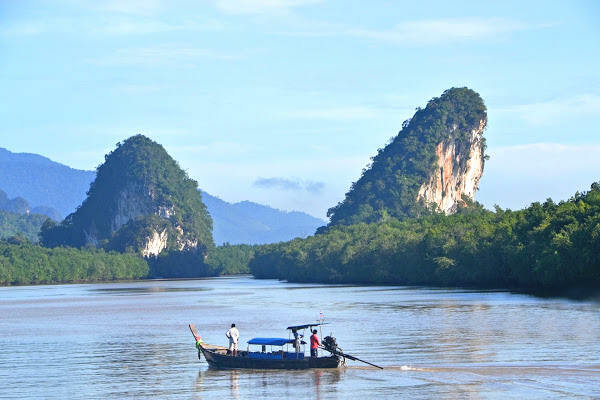 Take a ride along Krabi River and explore caves, mangrove forests, wildlife, fisherman's village, watching sunset and star gazing in the heart of Krabi. For driving adventure, take a ride on an ATV (All Terrain Vehicle, also known as a quad bike). 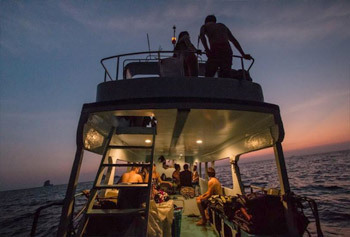 Diving courses, day trips and even liveaboard excursions are all offered. Sightseeing tours are also very popular with plenty of oppurtunities to enjoy the wonderful scenery or to visit the local islands and beaches. 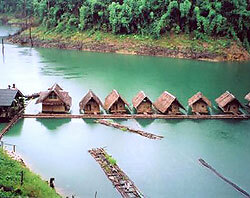 Hot springs, temples and caves are also visited. 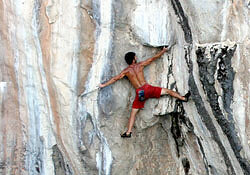 Slightly more energetic activities include rock climbing on Railae beach and sea kayaking. 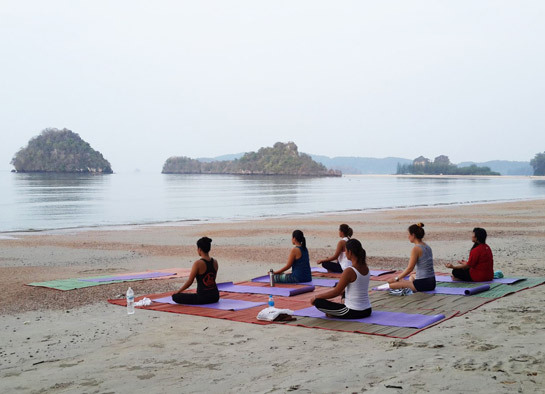 Private Classes are the perfect choice for individuals seeking one on one attention for their yoga practise.Private lessons can be used to specific concerns such as injuries, therapeutics, stress management, pregnancy, etc. ****Transfers to and from hotel/resort included in price for guest staying in Ao Nang & Krabitown & Ao nam Mao. Guest staying on Railay and Tonsai beach must arrange transfer to Ao Nang Pier or Ao Nam Mao by themselves. 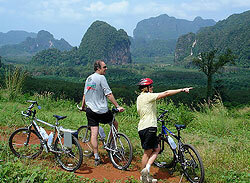 Ao Nang Village is where tour operators will pickup/return guest staying at Railay Beach. Less than 1 days.....will incur a 100% cancellation fee regardless of circumstances.